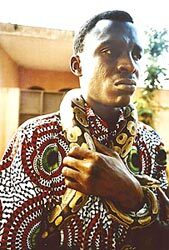 A scarified cult member wearing a snake necklace. Landscape view of the Bétamarribé village of Tampegre and some of its tata houses. Bétamarribé houses called tatas resemble small fortresses and are purposefully separated from other homes by distances up to a half mile or more. 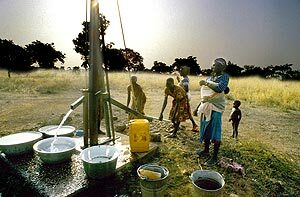 In fact, most Bétamarribé villages are spread out over several miles of rocky and hilly landscape..
Pumping water in the Bétamarribé village of Koaba. 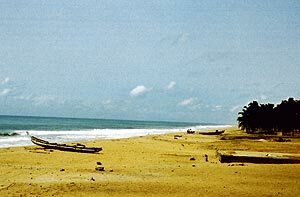 North Benin is much drier and dustier than the tropical south. Télesphore Sekou was my companion and guide during my trip to the Bétamarribé villages of northern Benin. Originally from Tampegre, he moved to the city of Natitingou when he was still a boy to pursue an education. His mother and father were my gracious house hosts in Tampegre. 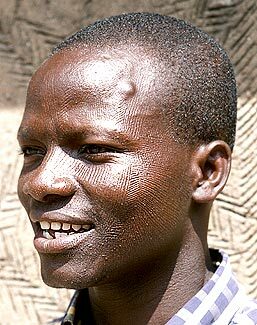 Télesphore’s beautiful facial scars were given to him by the master N’dah Yerime. Tatas are believed to represent a microcosm of the Bétamarribé universe. For example, the house is broken into three parts; the top represents the sky (abode of the gods), the middle the earth, and the smoky bottom floor the underworld (land of the ancestors). In essence, the family house symbolizes the unity of man with the gods, the deceased ancestors, and the earth from which life sprang. 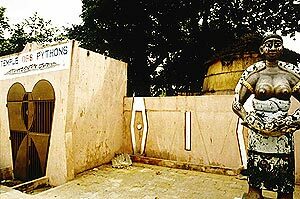 Sacrificial mounds and jars dedicated to the ancestors are placed around the house and near the door. Kouagou N’da Noel (pictured here) explained that tata architecture had a profound purpose in the past. 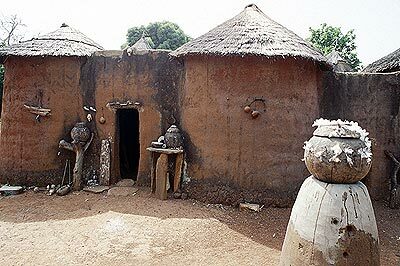 During the slave period, individual families could hold out in their castle-like homes for weeks because their granaries and food-drying areas were situated on the roof. 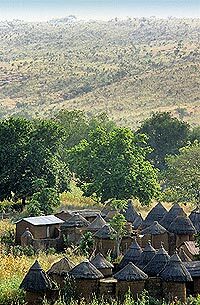 And since there was no village center (e.g., tatas were spread out over the landscape), slave traders became quickly frustrated in their efforts to capture large numbers of slaves in the Bétamarribé region. Bétamarribé scarmasters (odouti) can be male or female and the profession is usually passed down from a parent to a child who is willing to learn the complexities and dangers of working with blades and human skin. When a boy or girl reaches two or three years of age, an intricate series of lines are cut into their faces with an iron tool made by the blacksmith. 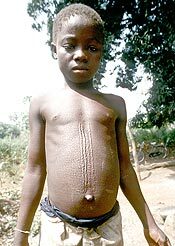 The elders say that a child without these markings is not “human” and if they don’t receive the cuts, or if the child dies before he or she is able to receive their tribal markings, they are not buried in the village cemetery because they are “not Bétamarribé” in the eyes of the ancestors. A) Young Bétamarribé boy from Koaba with a slingshot around his neck. The scar patterns cut into the faces of Bétamarribé men resemble the intricate structure of a finely woven textile. One-hundred years ago, men selected one or two symbols from their scar patterns and placed them on their belongings so that they would serve as personal property marks. 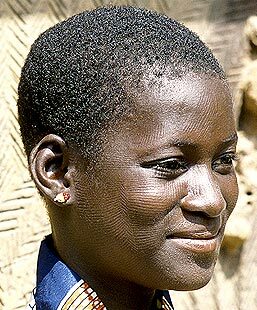 B) All across Benin, nearly every man or women wears a specific type of scar pattern or tattoo on their face to mark their tribal membership. 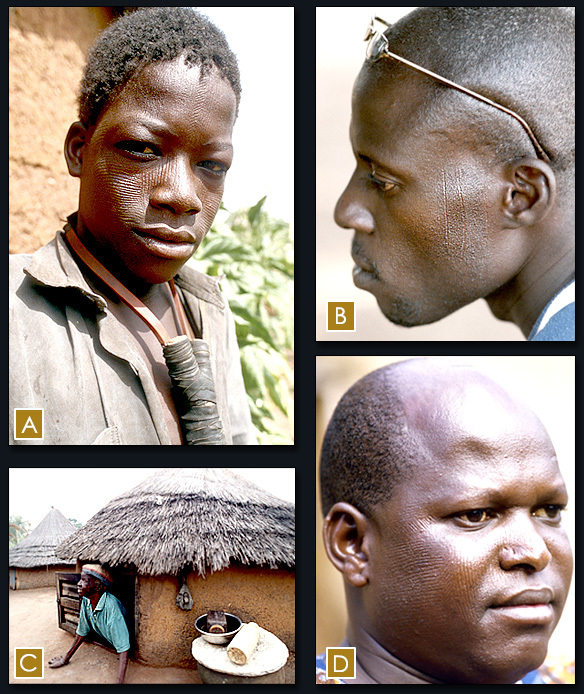 Mamadou is a Bariba tribal member and owns three simple yet distinctive facial scars. Similar markings continue down his arms and legs. C) M’Batinin learned the art of scarring from her mother Dimatideni, seen here peering out of her bedroom window atop the tata, who is another legendary scarmaster. D) 37-year-old Robért wasn’t scarred until he was nine years old which is rare by Bétamarribé standards. Robért left his family village over twenty years ago to seek an education in the city, and he told me that he will not have his three children scarred because he believes the practice is too brutal. 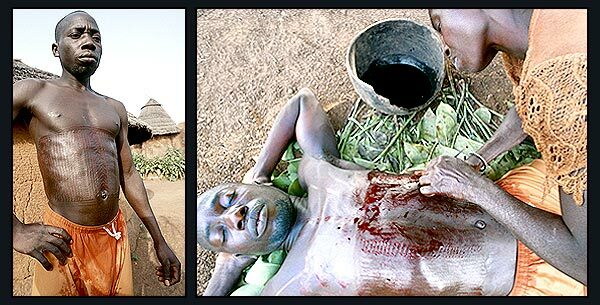 Of course, scarification practices are no longer legal in the cities, and today they can only be carried out in rural villages. 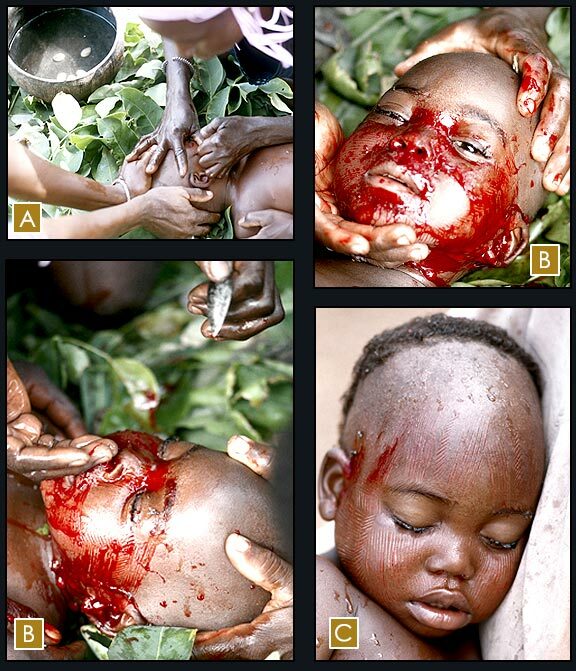 A) This series of photographs depicts the process of facial scarification. First, the scar pattern is divined with cowrie shells cast into a water pot. B) Next, the child is placed on a bed of leaves and then the cutting begins on the temple. Every child I witnessed being cut screamed and writhed in pain. One passed out halfway through the cutting, but he regained consciousness towards the end and resumed his bloodcurdling cries. C) Finally, once the shea butter is applied to the wounds for healing, every child seemingly fell fast asleep which was a calming sight. I can only imagine how my body would react to such a surge of physical and emotional shock especially at such a young age! 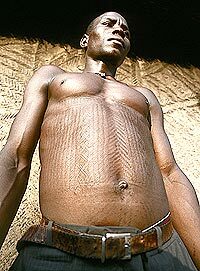 Natché, a young Bétamarribé man living in the village of Tampegre, is very proud of his chest markings: “When I was very young, I realized that my father had scars on his face. And when I saw myself in the mirror, I thought to myself that it was beautiful. That is why I decided to get my stomach scars. They let me present myself to women, because if I have beautiful scars no woman will be able to refuse me and I will be able to get married. 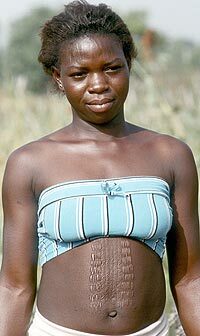 I am proud to wear the marks of a Bétamarribé man.” Natché paid 1000 Francs or $2.00 for his painful stomach scars. He completed all of them in one day. The grandson of scarmaster N’dah Yerime. N`tcha is a young farmer and traditional dance instructor in Tampegre. When I first met him, I noticed that he had received the first stage of his stomach scars which resembles a belt of approximately three hundred small diagonal cuts on either side of his navel. But because he is the role model for many young teenagers wanting to learn the traditional dances of their ancestors, which is a dying art form, he decided to get the rest of his chest scarified “so that the kids can know it, see it, and transmit it to the future generations. That way, we will loose nothing of our culture.” And because N’tcha travels throughout the Bétamarribé region with his dance troupe, I am certain no one will forget seeing his remarkably beautiful scars. Above, the Bétamarribé martial art of dopiti is a training exercise that prepared young men for war against neighboring tribes. Traditionally, combat was staged at a particular location and men would face off against one another with spears, knives, and whips. In dopi­ti­, two men armed with leather whips and a cowhide shield attached to a bow for stringing arrows trade blows. Movement is constant, and the first man to draw blood is declared the winner. 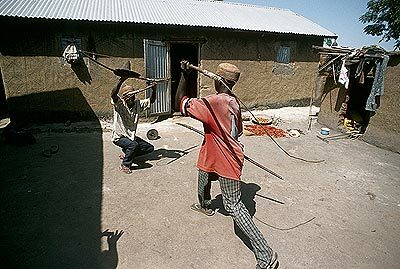 Whipping is an important part of ritual life among Bétamarribé men. 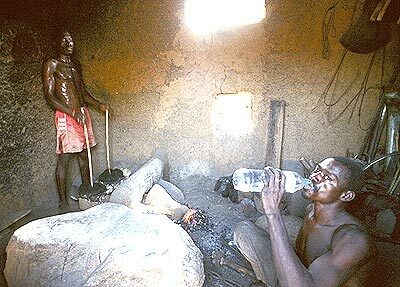 During their initiation and marriage dances, men have to withstand hours of whipping to test their manhood. And if they show any signs of pain or fear, they are branded as cowards for the rest of their lives. I couldn’t leave the land of the Bétamarribé without a souvenir, and I asked M’Batinin if she could give me a belt of scars under a shady tree. Within ten minutes I had received over 300 cuts!